This delicious salmon pasta salad is everything you need this summer. Light, but filling at the same time, with fresh salad leaves and tomatoes, baked salmon and a healthy and tangy dill dressing. Whether you enjoy it at home or on your lunch break at work, or just have a quick dinner, this salad is be your new favourite recipe. Oh, did l mention that it’s very healthy too? Why buy ready-made salads, when you can prepare it at home in no time. Easy to store and you can keep some in the fridge for later too. I actually prefer eating it cold from the fridge, rather than straight away, it tastes even better when it’s proper cold. Salmon is my favourite fish, it tastes less “fishy” than other types of fish, it is highly nutritious and an excellent source of omega 3. 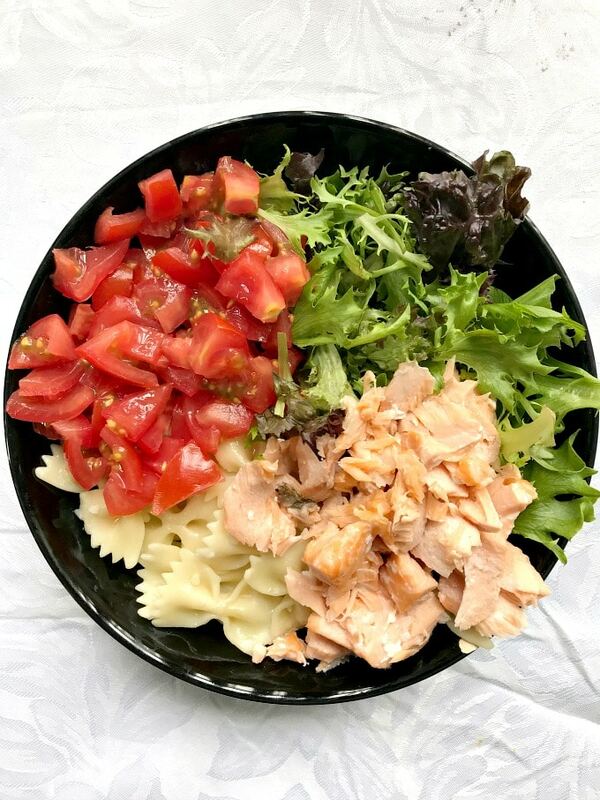 The salad leaves bring some freshness and a bit of crunch, together with the tomatoes, and they contrast well with the pasta and salmon. You can go for any pasta shape, if really does not matter which one, although I think this shape is pretty cool for salads, for pasta dishes with sauce I usually go for fussilli or spaghetti. But, again, that’s not a rule, it’s purely how I cook it. The dressing is light and sharp, enhancing the flavours of the salad. I prefer the salmon baked for this recipe, but you can also grill or boil it. Or swap it for smoked salmon instead, for a bit more saltiness. 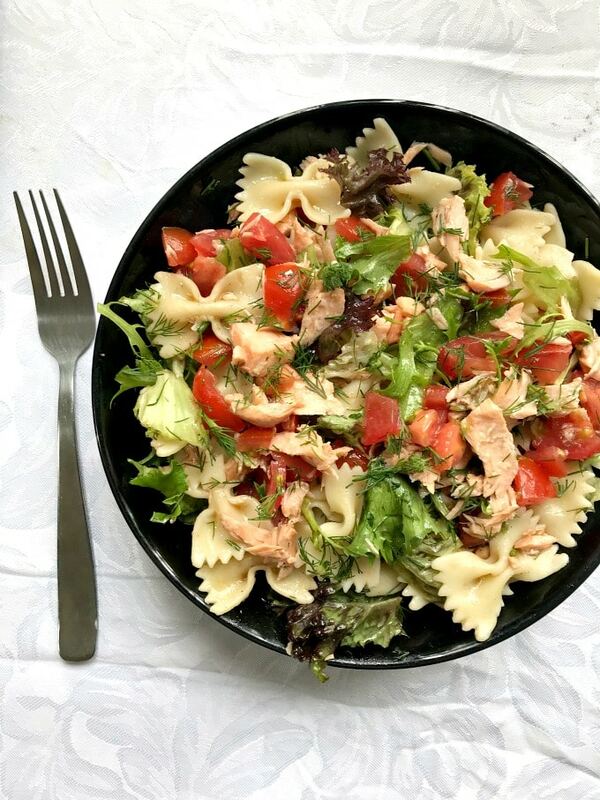 Although I think this pasta salad with salmon is a real treat on a hot summer day, as it can be enjoyed cold straight from the fridge, it can of course be made all year round. 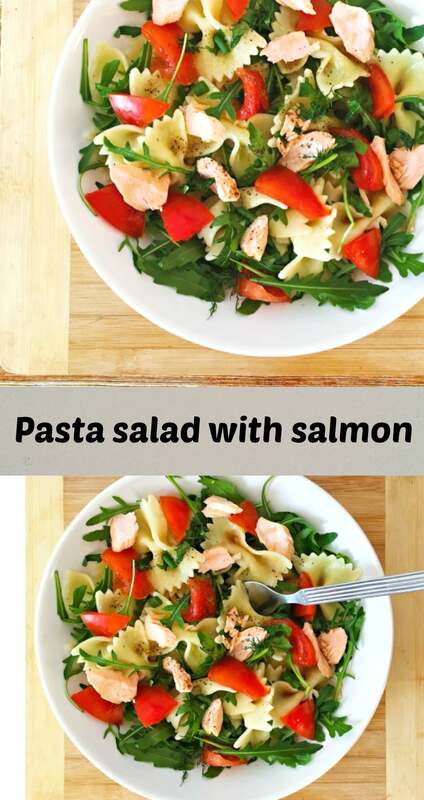 How do you make salmon pasta salad? This salad can’t be any simpler to make. First, cook the salmon fillet, you can either pan fry it, or, even better, bake it. Wrap it in kitcken foil, and bake for 15 minutes at 200 degrees Celsius (390 Fahrenheit). Leave to cool. Meanwhile, cook the pasta according to the packet instructions, drain, rinse with water, and toss with olive oil. You can add any other salad to it, I went for mixed salad leaves, but you can choose any salad you like, lettuce, spinach, arugula, you name it. Again, other veggies can be added, cucumber, avocados, etc etc Mix everything together and pour over the dressing. How do you make a healthy dressing for salad? 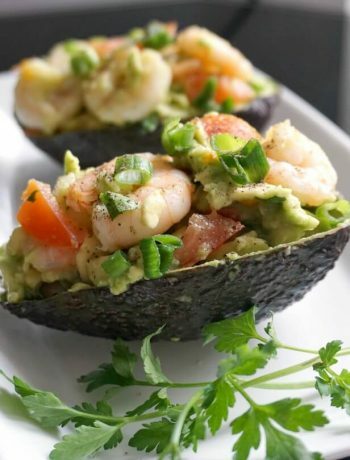 No need to go for heavy and super rich salad dressings with hundreds of calories, when you can make one light healthy dressing with no mayo or other nastiness. For my dressing, you will need olive oil, basamic vinegar, chopped fresh dill (which goes super well with the salmon), and salt and pepper to taste (or even some chilli if you like). Give it a good shake, and there’s the best dressing one can get. You can use this light dressing for any kind of fresh salad. If you are looking for other healthy salad recipes, how about my Chicken Caprese Pasta Salad? 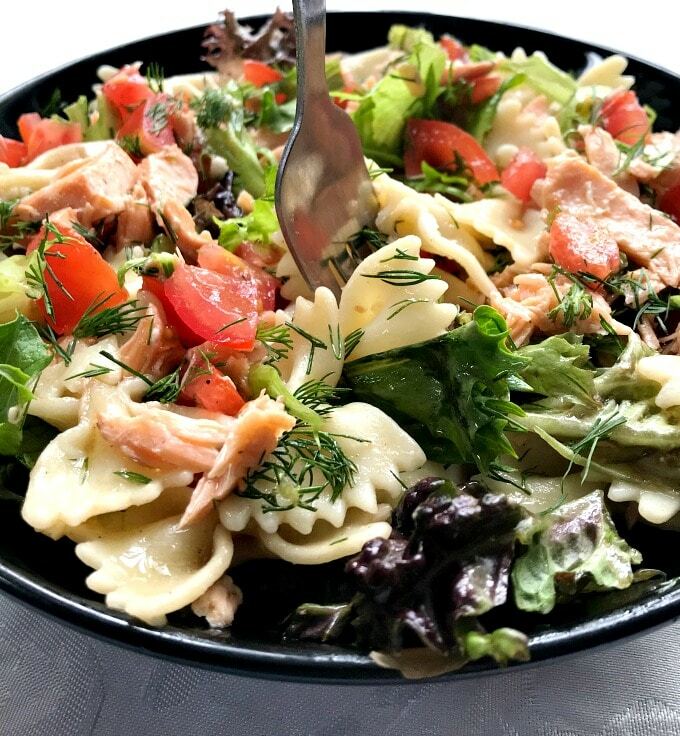 If you’ve liked the SALMON PASTA SALAD (NO MAYO) or any other recipe on the blog then don’t forget to rate the recipe and let me know how you got on in the comments below, I love hearing from you! You can also FOLLOW ME on FACEBOOK, and PINTEREST to see more delicious food and what I’m getting up to. 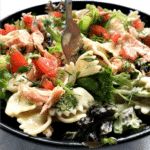 This delicious pasta salad with salmon is everything you need this summer. Light, but filling at the same time, with fresh salad leaves and tomatoes, baked salmon and a tangy dill dressing. Whether you enjoy it at home or on your lunch break at work, or just have a quick dinner, this salad is be your new favourite recipe. Bring a pan of salted water to a boil and cook the pasta according to the packet instructions. Add a splash of olive oil to the pasta, then set aside and leave it to cool completely. Meanwhile, preheat the oven to 200 degrees C (390 Fahrenheit). Wrap the salmon in kitchen foil and place it on a tray. 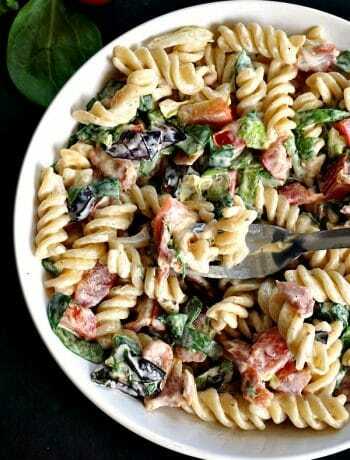 Transfer the pasta to a large bowl and toss in the salad leaves, chopped tomatoes and flaked salmon. To make the dressing, mix olive oil, balsamic vinegar, chopped dill, salt and pepper. Pour the dressing over the pasta mixture and mix well to coat evenly. Thank you, Millie. As much as l love salads, they are not so filling, but adding pasta worked really well. Glad you liked it ? Thank you! I love salmon too, it is so easy to cook and can be used in so many dishes. Glad you like this salad ? Thank you, glad you liked it ? 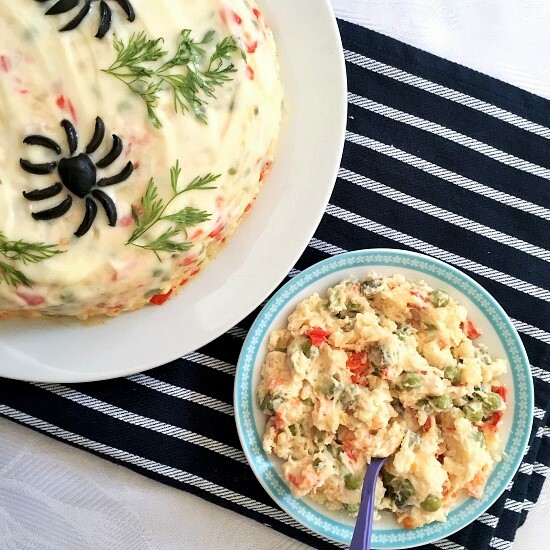 Thanks for this superb recipe, Daniela! It was super yummy for my family and me, simply because the dressing combined the dish together so perfectly. I just grilled the salmon instead of baking it. I’m so glad you enjoyed it, Maria! It is a dish l can never have enough of, l love salmon cooked in any way! About one tablespoon of chopped dill would do.